The Ratel Infantry Combat Vehicle (ICV) takes its Afrikaans name from the South African honey badger. This animal, despite its small size, is a fierce creature which is able to absorb a large amount of physical damage as well as dish it out with its long claws. The Ratel vehicle is therefore well named as it armament and mobility make it a formidable opponent. It was designed and produced at a time when South Africa was subject to ever more strict international embargoes because of its segregation policies (Apartheid). The historical background is also set in the backdrop of the Cold War in Southern Africa which saw a steep rise in liberation movements backed by Eastern Bloc communist countries such as the Soviet Union. 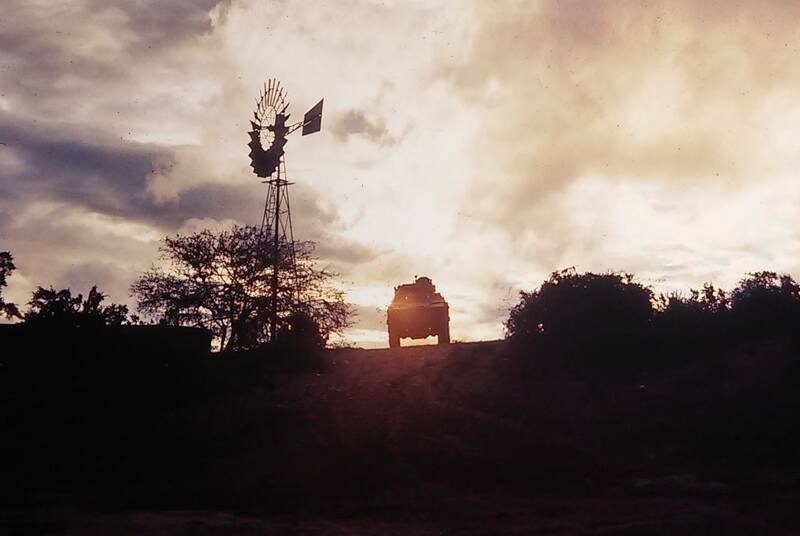 During the mid-1960`s there was a growing realization in the South African Defence Force (SADF) that foreign imported armoured troop vehicles, such as the Saracen, were not up to the task against modern threats and the requirements based on the challenges found in the Southern African environment. 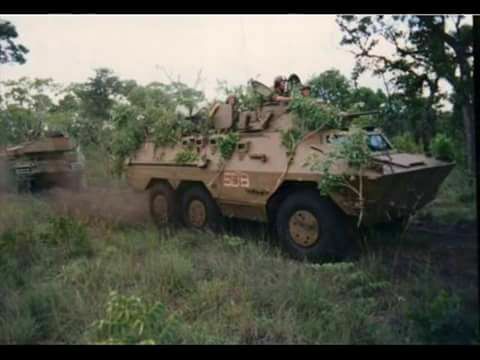 What was needed was a highly manoeuvrable, ultra-reliable and easy to maintain ICV armed to the teeth, which could fulfil the doctrine requirements being developed by the SADF for mobile warfare based on an indirect approach and low force density. The “indirect approach” is based on surprise and flanking attacks and avoids frontal attacks on well-prepared defended positions. “Low force density” describes the ratio between the number of troops and the ground they need to hold. 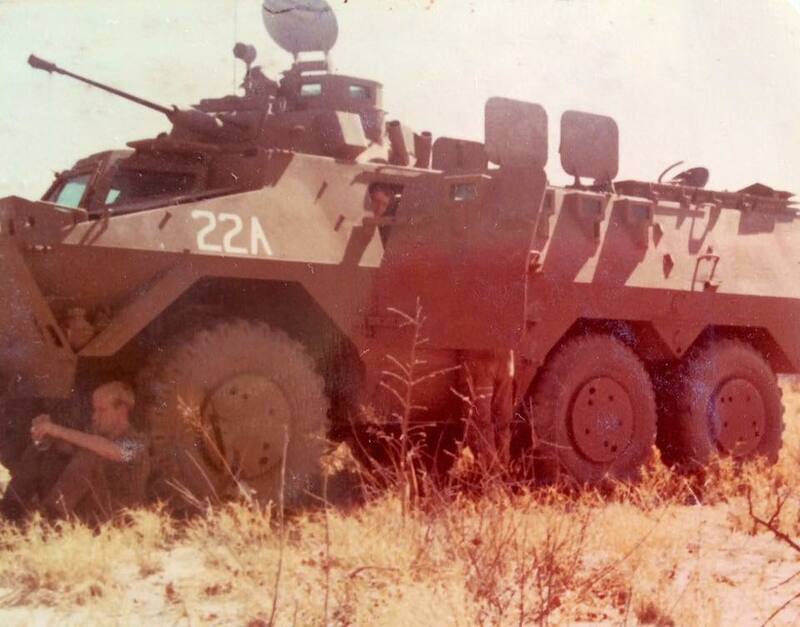 In the SADF’s case, few troops over a large area necessitated quick movement, something the Ratel ICV was built for. Design work on the 6×6 wheeled Ratel began in 1968. It was intended to carry troops rapidly into and out of battle, making mobility the primary characteristic, followed by firepower and armor. The first prototype Ratel was made of soft steel which allowed quicker modification work. The first four production Ratels were put through their paces at the Elandsfontein vehicle testing grounds near Pretoria in 1975. The first batch of 13 Ratels (Mk.1) was delivered from the production line at Sandrock-Austral in Boksburg from 1975 onwards. After operational field trial tests, improvements were implemented which focused on enhancing the Ratel`s “bush breaking capability” such as large covers to protect external headlights (which were covered by mesh wire at first) and a screen cover to keep leaves from being sucked into the engine. These modifications were only later designated as the Mk.2 standard. The Ratel 20 was put into production and operationally deployed in 1976. The final upgrade of the Ratel to the Mk.3 standard was implemented in 1985 and included more than 135 modifications such as an improved cooling system, additional fuel filters, digital acceleration meter and more robust bush protection (moving the front exterior lights lower and the steps to enter and exit the Ratel were strengthened). 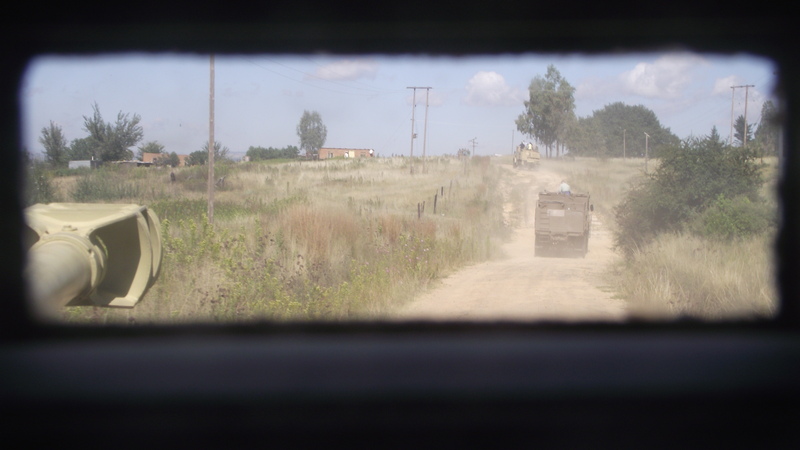 The Ratel allowed the SADF to wage conventional warfare from 1976 onwards as the South African Border War escalated and cross-border operations became more frequent and more complex. The primary liberation movement for South West Africa (Namibia), the “South West Africa People’s Organization” (SWAPO) conducted increasing daring cross-border sabotage, intimidation and assassination raids from their bases in Angola into South West Africa. Ratels, with their high speed and endurance, were employed to intercept SWAPO raiders when they crossed the border. High-mobility operations saw Ratel formations often consisting of battalion-sized columns with mixtures of other South African produced military vehicles (Buffel, Eland, Samil etc.) leaving their bases located near the northern border of South West Africa to conduct deep incursions into Angola against SWAPO training and logistic camps. These cross-border incursions by South Africa saw an alliance between itself and the National Union for the Total Independence of Angola (UNITA) which were engaged in a more conventional war against the Cuban and Soviet-backed Popular Movement for the Liberation of Angola (MPLA) and the Angolan conventional army, the People’s Armed Forces of Liberation of Angola (FAPLA), for control of Angola. The war escalated as Cuba, backed by Soviet advisors, sent troops and equipment into the fray. 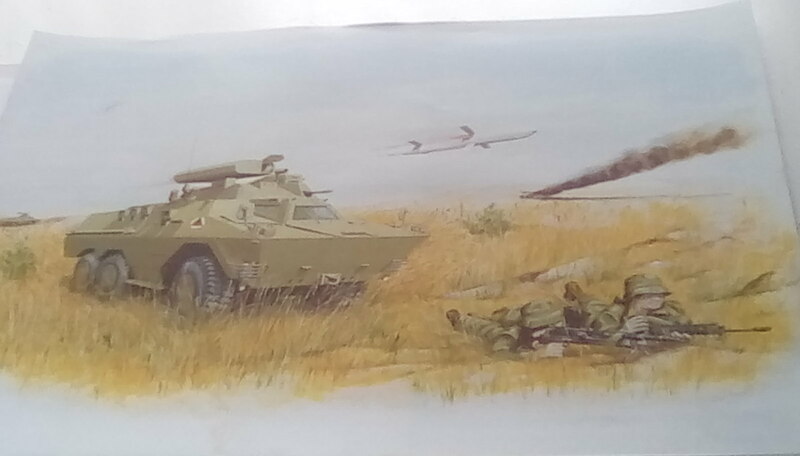 The SADF doctrine of mobile warfare made maximum use of the Ratel`s characteristics and allowed them to influence the flow of the war and hold the line against numerically superior adversaries until peace was declared in 1988. Approximately 1400 Ratels were built. They were fielded with SADF units such as the 61 Mechanised Battalion Group, 32 Battalion and 4 South African Infantry Battalion. Other units that made use of the Ratel were Citizen Force Mechanised Infantry units as well as other branches of the then SADF such as artillery, engineers and signals. Ratels have also been exported to Cameroon, Djibouti, Ghana, Jordan, Libya, Morocco, Rwanda, Sahrawi Arab Democratic Republic, Senegal, Yemen and Zambia. According to Major General Roland de Vries (retd. 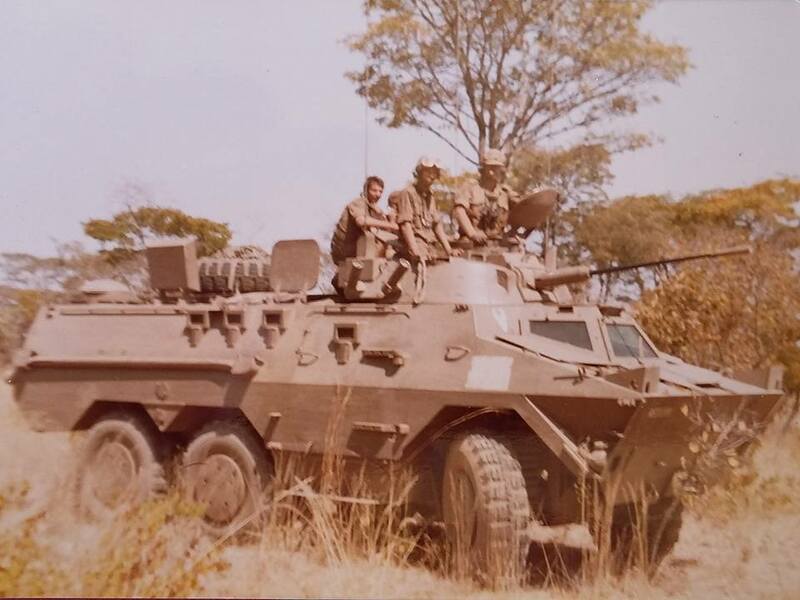 ), who was closely involved with the Ratel design and doctrine development, the Ratel was the best vehicle ever made for the ultra-mobile African bush warfare. The terrain it operates in is some of the most hostile in the world, which alone inflicts harsh punishment. Characterized by its large wheels, swiftness, bush breaking ability, and versatility as a weapons platform, it was a fearsome adversary in skilled hands during the South African Border War. The Ratel`s 6×6 wheeled configuration was designed for the African battle space and characterized by its versatility and cross-country capability. A six-wheel 14:00 x 20, run flat (designed to resist the effects of deflation when punctured) configuration offered more reliability and required less maintenance than tracked vehicle such as the American Bradley and Warsaw Pact BMP. The Ratel has 350 mm of ground clearance and can ford 1.2 m of water. Unintentional tests have proven that the Ratel is as amphibious as a brick. The Ratel makes use of the Büssing D 3256 BTXF six-cylinder direct injection turbocharged diesel engine which produces 282 hp (14.8 hp/t). The engine is located at the rear left of the vehicle and proved more than sufficient to navigate rough terrain and to push through dense bush and small trees. The power pack can be field stripped and replaced in roughly 30 minutes by two men using a crane. The engine is coupled to an automatic powershift gearbox containing a hydrodynamic torque converter which eases driving. The gearbox can also be operated manually and had a mechanical emergency gearshift. The power is transmitted to the three axles in two stages with a final decrease using a planetary gearing which is located in the wheel hubs. Each of the three axles has their own lockable differential and longitudinal differential locks. The suspension utilized progressive acting coil springs as well as large hydraulic shock absorbers. Remarkably, the Ratel`s operational range was a 1000 km via road and 600 km cross country, which enables flexible force movement in order to achieve surprise. This implies long missions over rugged and variable terrain with little logistical support. It needs to be well armed and self-sustaining, carrying its own supplies, spare parts and a section of infantry. All Ratels can operate over long distances and are loaded with all sorts of equipment and supplies. Spare wheels are lashed to the roof of the hull, while food is stored in every available space (as well as a few cases of beer). The average number of 7.62 mm machinegun rounds carried is at least 6000. All Ratels feature tactical radio communication which enables reliable command and control which further enhances the vehicle’s force multiplier effect. Spare whip aerials for the radio are always carried somewhere on the hull as they have a tendency to break when driving through the brush. The Ratel is equipped with two drinking water tanks as standard and each vehicle carries a cooking stove, tool kit, tow bar, cable and spare parts. One in every four Ratel’s carries a field shower kit. The overall emphasis is on self-sufficiency, from fire support to first aid. The Ratel was the first wheeled ICV to ever enter service. It featured a proper commander’s cupola which offered a 360-degree field of vision. The commander was located on the left side of the turret while the gunner sat on the right. The driver’s compartment is located at the front and center of the vehicle, from where he has an excellent 270-degree visibility through three large bullet-resistant windows. During the battle, the driver can activate three armored shields which pop up and to cover the windows for extra protection. When the armored shields are activated the driver uses three day-periscopes with a view of the front, left and right to drive. The driver can enter and exit the vehicle from either a roof hatch located above his seat or through the interior of the vehicle. All Ratels can be fitted with a small crane jib or tow bar at the rear which is used to tow a damaged vehicle out of action. The hull has entry doors on the left and right which are operated with a hydraulic system to ensure the doors close at any angle while the door at the rear of the hull is manu-matic. The Ratel has several roof hatches which can be used for loading and emergency exiting should the need require. A Ratel 20 carries a standard complement of three crew and up to eight fully armed and equipped troops. The Ratel`s interior can be considered crowded and although not standard procedure, space can be found for an additional three passengers when required. The mounted troops sat back to back allowing them to shoot out of the four firing ports located on either side of the vehicle. The section leader was also the vehicle commander and sat on the left side of the turret from where he could see through the driver’s window. Located at the rear of the vehicle, another hatch could be equipped with a 7.62 mm Browning on a mount which was primarily used for local and air defense. The success of this air defense arrangement was useless but was sometimes used to great effect in the ground role. The Ratel carries four 81 mm smoke grenade launchers, two on either side of the turret. Ratels could either fight through an objective by firing its main weapon while the infantry fired out of the firing ports or alternatively, the Ratel would fire its main armament while the infantry dismounted from the entry doors on either side of the hull. While on operations, the roof hatches were often kept open due to the heat. The infantry often sat on top of the hull whenever safe to do so. The Ratel was designed for speed and mobility at the cost of armor. The Ratel has effective thickness of 20 mm (at 60 degrees) over the frontal arc. The upper hull sides are 8 mm (at 65 degrees), lower hull 10 mm (at 90 degrees), rear hull 10 mm (at 90 degrees), top hull 6 mm and floor hull 8 mm. The frontal arc offers protection against 12.7 mm armor piercing (AP) rounds while the rest of the hull is sufficiently protected against shrapnel and 7.62 mm AP rounds. Ratels are extremely susceptible to fire from Russian-supplied 20 mm and 23 mm anti-aircraft weapons (often employed in a ground defense role by the MPLA and Cuban forces). Contrary to popular belief, the Ratel, although designed with the threat of mines in mind, does not feature a V-shaped underbelly. It’s mine resistance is derived from the hull`s height above the ground, which is due to its large oversized wheels. The wheels are also designed to blow off and thereby disperse some of the explosive energy. Additionally, the wheel arches form a V-shape which helps deflect mine blasts. During the South African Border War, only one Ratel mine fatality was recorded when a Ratel drove over a double anti-tank mine which detonated under the belly of the vehicle during Operation Meebos in 1982. 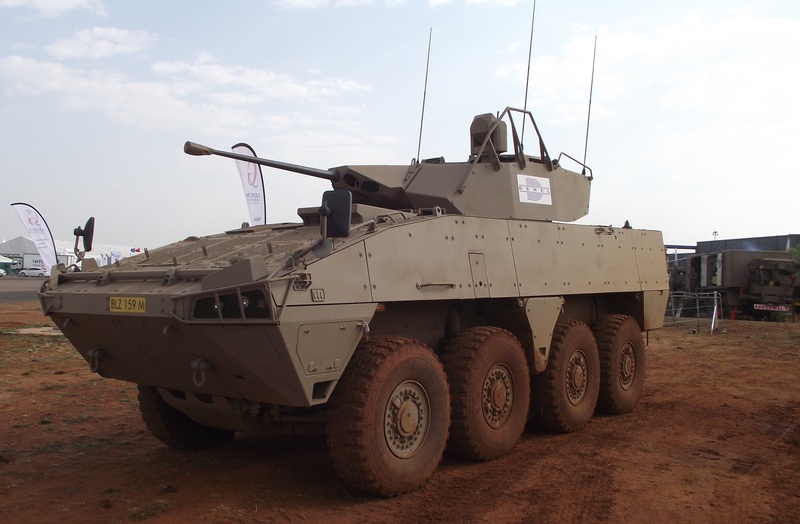 The Ratel platform served as the basis for an entire family of fighting vehicles which forms the backbone of the South African Mechanised armed forces and includes the basic Ratel 20, Ratel Command, Ratel 60, Ratel 90, Ratel 81, Ratel ZT-3, Ratel Ambulance, Ratel Logistic, Ratel EAOS and the Ratel Recovery. The Ratel 20 carries three crew members and can accommodate anywhere from eight to eleven mounted infantry (mission dependent). In line with the doctrine of offensive operations, which requires rapid closing with and destruction of the enemy, the main variant of the Ratel features a two-man turret with the first ever dual fed F2 20 mm quick firing cannon. This is a licensed copy of the French GIAT gun and produced in South Africa by LIW, which later became Denel Land Systems. The cannon’s primary purposes are to lay down sustained suppressive fire, engage enemy troops and to destroy soft skinned and lightly armored enemy vehicles. The canon can elevate +38 degrees and -8 degrees. The 20 mm cannon produces a high rate of fire to support dismounting infantry with high explosive (HE) rounds effectively up to 2000 m and armor piercing (AP) rounds up to 1000 m. The Ratel 20 also carries three 7.62mm Browning machine guns, one coaxial, one on the turret and one at the rear of the vehicle, which was primarily used for local and air defense. The Ratel Command is equipped with a turret which traditionally houses a 12.7 mm Browning heavy machine gun as well as the standard coaxial 7.62 mm Browning machine gun and an additional machine gun on top of the turret. The smaller main gun allows for a more spacious turret interior compared to the Ratel 20. The Ratel Command carries the standard three-man crew (vehicle commander, driver and main gunner) with space for six command post personnel. The troop compartment is fitted with map tables, communication equipment to fulfill its designed role specifications. To keep the additional communications equipment from overheating an air-conditioning system was fitted. Other variants included Ratel 20 Command and Ratel 60 Command. One Ratel 60 is typically assigned to an armored car troop for the purpose of reconnaissance, fire support and anti-ambushing. It is fitted with a turret that carries a short 60 mm M2 breech-loading mortar and the standard coaxial 7.62 mm Browning machine gun. In the direct role, the 60 mm mortar is effective up to 300 meters, or 1700 meters in the indirect role. The 60 mm mortar can fire HE, canister, smoke and illuminating rounds. The vehicle most often operates from the rear to supply indirect fire. The Ratel 90 is based on the Ratel 20, but mounts a turret with a low velocity 90 mm gun, all identical to the Eland 90 which it replaced. Further changes involve the reworking of the roof lining and a reduction of the troop compartment roof hatches from four to two. The Ratel 90 also carries one less passenger in order to make room for more ammunition for its main gun with the installation of extra ammunition racks. The Ratel 90 serves as a fire support vehicle used to knock out strong points and, while not originally designed for the anti-tank role, proved more than a match for the T-34/85 encountered early on during the South African Border War. As from 1981, the stakes were raised when FAPLA received T-54, T-55 and T-62 tanks from the Soviet Union and Cuba. Mechanised Infantry Groups fielding Ratel 90s achieved success by skillfully outmaneuvering the newer Soviet tanks which required multiple hits with 90 mm high-explosive anti-tank (HEAT) rounds from their 90 mm guns, often at point blank range at vulnerable points (engine vents, turret rings) in order to disable them. 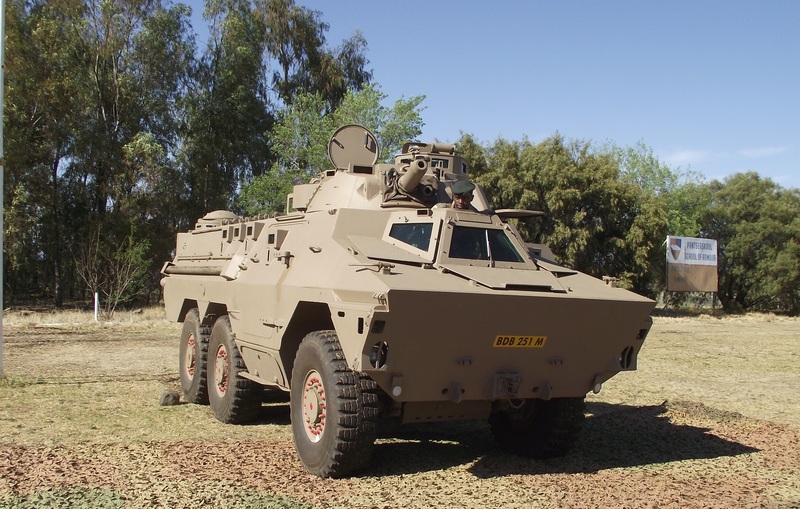 The first four prototypes of the Ratel 81 were delivered to 1 South African Infantry (1SAI) on 12 November 1985. The Ratel 81 has no turret and instead receives a commander’s cupola where the turret would have been located. It is equipped with an 81 mm mortar firing through the roof hatches located in the center of the vehicle. The 81 mm mortar is mounted on a turntable with can traverse a full 360 degrees. This version only has two firing ports on either side of the vehicle. Besides the standard three-man crew the Ratel 81 carries the three-man mortar team and 148 mortar rounds (although this can be increased through creative stacking). The vehicle mostly operates from the rear to supply indirect fire through shoot and scoot tactics. The Ratel 120 was a Ratel 81 fitted with a 120 mm mortar with only a few modifications necessary. Successful tests were conducted in 1993 at Alkantpan which showed that the 120 mm mortar firing at maximum charge had no negative effect on the Ratel`s suspension system. No Ratel 120 vehicles were produced beyond the prototype. The ZT-3 is a dedicated anti-armor, support, and reconnaissance vehicle and is equipped with a state of the art 127 mm anti-tank missile system. Due to international sanctions, the SADF had no anti-tank missile which could effectively deal with modern main battle tanks. 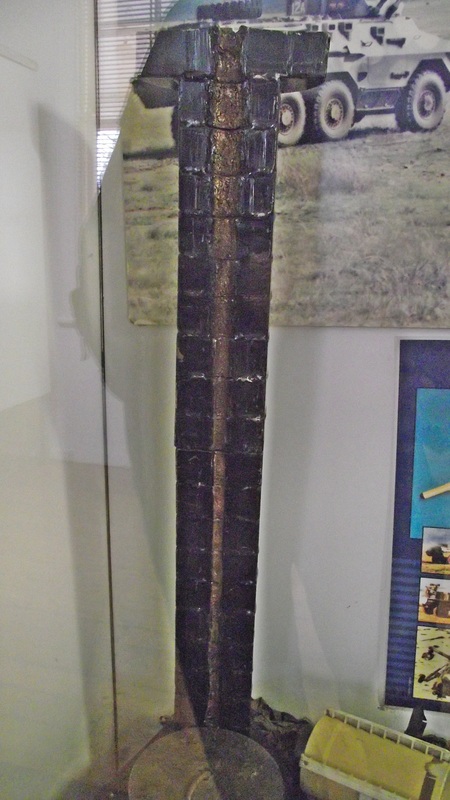 The South Africans produced the Ingwe (Leopard) missile and launch system, which was developed to breach the said gap. The Ratel ZT-3 was the end result of the marriage of the Ratel and Ingwe missile system. This was the first truly modern anti-tank system in the South African military inventory which could engage and destroy modern military main battle tanks. The Ingwe has a 5000 m standoff range and makes use of laser beam riding. It mounts a tandem warhead to counter explosive reactive armor. The missile system is mounted on a modified Ratel 60 turret and, unlike most dedicated AT platforms, carries three missiles instead of the standard two. A total of 12 missiles are carried inside the hull for manual reloading. The Ratel ZT-3 made its combat debut while still in preproduction, in September 1987 as part of Operation Moduler, when four ZT-3 vehicles were assigned to 32 Battalion. One of the ZT-3 vehicles destroyed three Soviet tanks at 2000 m in a space of 10 minutes. A sound bite of this engagement can be listened to by clicking here. The SANDF has 53 ZT-3 vehicles. Early concept sketch of what would become the ZT3 missile tank destroyer. Image courtesy of Len Bramwell. Since its introduction in 1974 and subsequent evolution variants, the Ratel family of vehicles has formed the backbone of all mechanized operations by the former SADF during the South African Border War. It played an integral role during the 1998 Southern African Development Community (SADC) intervention in Lesotho which was led by the SANDF. Various United Nations peacekeeping forces make use of the Ratel in conflict zones. Exported Ratels have also been used during the Libyan Civil War, Yemeni Revolution and Yemeni Crisis (2011–present). The Ratel has left a legacy of 40-year service which few other military vehicles can overshadow. The Ratel is in its final operation service stretch. 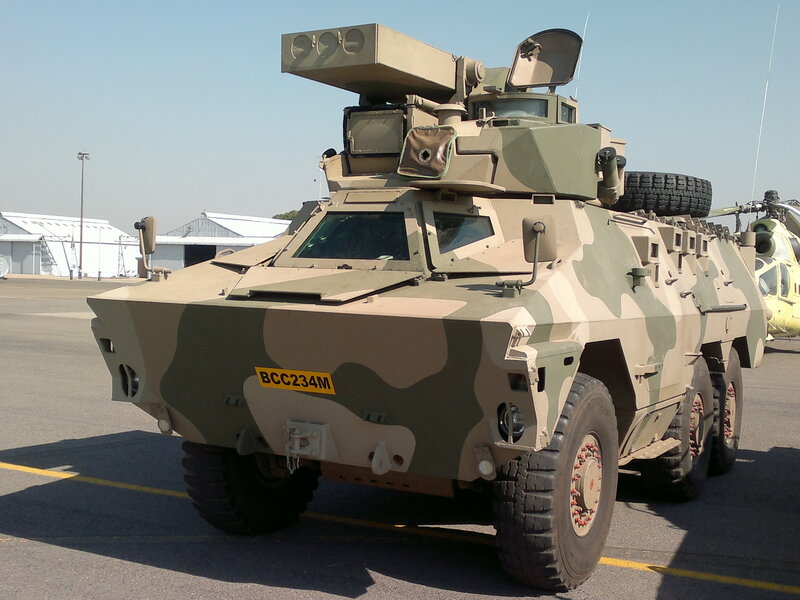 The SANDF, through “Project Hoefyster”, has chosen to replace two mechanized battalions worth of Ratels with the Patria family of ICV vehicles. These vehicles are patented and produced in South Africa as the aptly named “Badger ICV”. Armament Dual fed F2 20 mm quick firing cannon. Concept sketch of a two-cannon SPAAG version based on the Ratel. Image courtesy of Len Bramwell. Combat and Survival. 1991. Bush fighting with the Ratel: Volume 12. Westport, Connecticut: H.S. Stuttman Inc.
Heitman, H.R. 1988. Krygstuig van Suid-Afrika. Struik. Was trained technicaly on the ratel at that stage one of the best .This was in 1976 june .Eccelent arictcle !! Did training at MLV Bloemfontein in 87 on Ratel 20. Did ops Hooper with these machines 87-88. Great article back to the basics of military armour. A visual trace back into the past. Thanks for the great insight. What is the difference between Ratel and the Belgian Sibmas? And as a side note, The Malaysian also the ONLY user of Sibmas (Sibmas with 20mm turret, 90 cockerill turret, command and ARV variant) and still used them efficiently and bringing to full circle, they obtained the Ingwe missile to be equipped on Deftech AV8. Greetings Alex. The Sibmas was based on the original Ratel prototype with the aim to export which wasn’t very successful. As you noted only Malaysia bought it. The Sibmas has a more powerful engine and is somewhat lighter giving it more hpt. The Sibmas is amphibious making it ideal for the wet environment of South East Asia whereas the Ratel floats like a brick. Will we be seeing a separate article on the Sibmas? Not from my side. I specialise in SADF\SANDF only. The Ratel ZT-3 only carries 12 missiles at a time, three of which will be loaded into the launcher and not 15 missiles as this article implies. Also it is not used in the reconnaissance role. That role is carried out by other systems such as the other Ratel variants, Rooikat and Rooivalk. I have forwarded your comment to the author of this article and he will look into it. My father Len Bramwell worked for Kentron in 1980’s. Just dug out his first drawings of the Ratel which he did at his home in Kempton Park. He designed the initial concept of the rocket system on the turret mounted on the Ratel. Early copies of his work are returning with me to South Africa to be displayed at the Mechanized military museum in Bloemfontein. Very glad to hear they will find a place in the museum. If you have copies, please forward them to me so I can add them to the article. Or as a message on our Facebook page! e mailed through. We really look forward to having them appear on this excellent website. 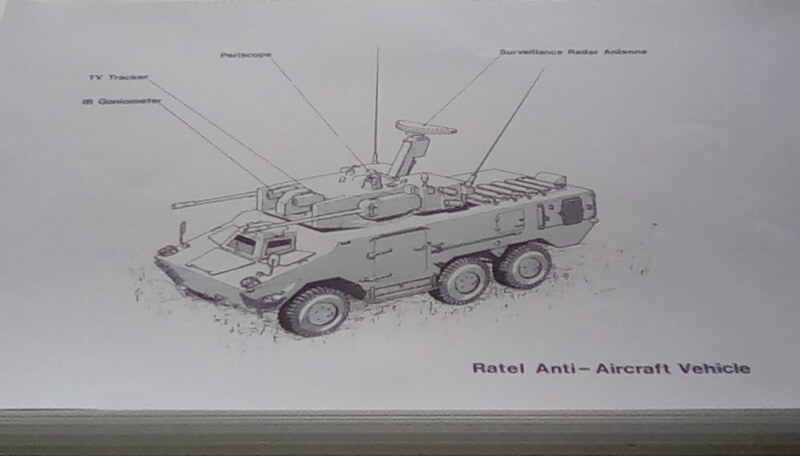 I have a picture of the Ratel 60, with mortar fitted, if you would like to use it. As well as the Ratel 81. Thank you Gordon. You can pm them to me on Facebook if possible. I will do so this weekend. I forgot to ask, should I send the photos to your personal Facebook page or the Tank Encyclopedia’s page?